Background Volumetric laser endomicroscopy (VLE) provides circumferential images 3 mm into the biliary and pancreatic ducts. We aimed to correlate VLE images with the normal and abnormal microstructure of these ducts. Methods: Samples from patients undergoing hepatic or pancreatic resection were evaluated. VLE images were collected using a low-profile VLE catheter inserted manually into the biliary and pancreatic ducts ex vivo. Histological correlation was assessed by two unblinded investigators. Results 25 patients (20 liver and 5 pancreatic samples) and 111 images were analyzed. VLE revealed three histological layers: epithelium, connective tissue, and parenchyma. 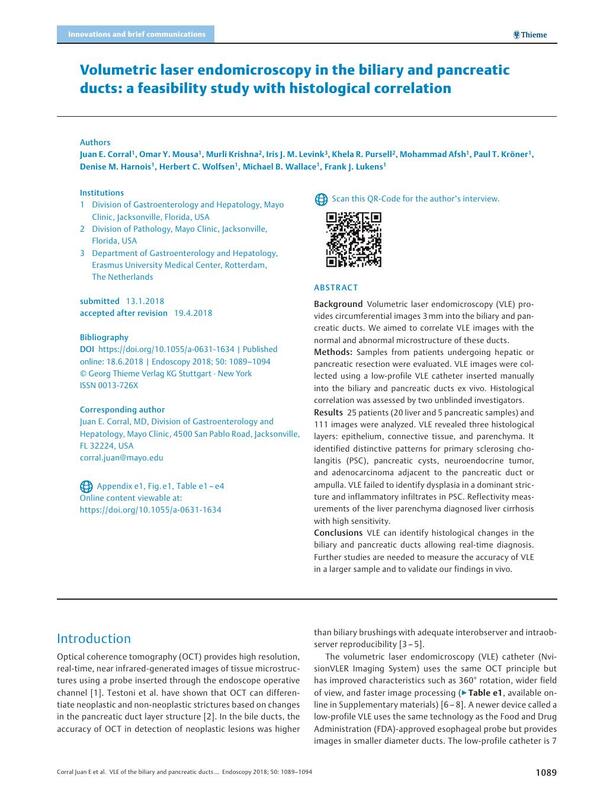 It identified distinctive patterns for primary sclerosing cholangitis (PSC), pancreatic cysts, neuroendocrine tumor, and adenocarcinoma adjacent to the pancreatic duct or ampulla. VLE failed to identify dysplasia in a dominant stricture and inflammatory infiltrates in PSC. Reflectivity measurements of the liver parenchyma diagnosed liver cirrhosis with high sensitivity. Conclusions VLE can identify histological changes in the biliary and pancreatic ducts allowing real-time diagnosis. Further studies are needed to measure the accuracy of VLE in a larger sample and to validate our findings in vivo.